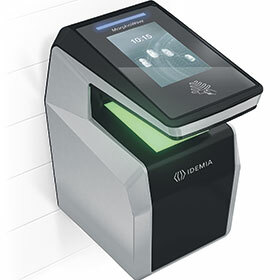 MorphoWave Compact is the newest addition to IDEMIA’s range of readers for frictionless biometric access control. It delivers the performance of MorphoWave contactless 3D fingerprint technology in a compact wall-mounted device, suitable for any location. Users are positively identified with a simple wave of the hand. The patented touchless sensor technology scans in 3D, and captures and matches four fingers on either hand and in any direction. It is immune to environmental factors (external light, dust), copes with wet and dry fingers, ensures no latent prints are left on the scanner, and mitigates hygiene concerns. The reader’s high-speed, touchless acquisition capability allows users to remain in motion while being identified. IP65 rated and PoE+ powered, the compact wall-mount reader ensures that MorphoWave technology can be deployed at every location. MorphoWave Compact is already integrated with more than 25 of the industry’s leading access control systems. The system natively supports Prox, iClass, MIFARE, DESFire cards and PIN code, in addition to biometrics. It is also capable of scanning QR codes for visitor management.